Years ago in 1610, Sir Edward Coke, Chief Justice of the Common Pleas declared in Dr. Bonham’s case that “in many cases, the common law will control Acts of Parliament”. This historic declaration gave rise to a everlasting debate regarding the extend of power between the Parliament and the Judicial organ and also played an important role in developing a check and balance concept which is known today as the “Judicial Review” system. In Kudrat-e-Elahi v. Bangladesh, 44 DLR (AD) 319 Mustafa Kamal J held that even Constitutional Amendments fall within the definition of ‘any other law’ referred to in Art. 7(2) of the Constitution (Para 84) thus is subject to judicial review. Although, according to the law minister the High Court did not have the jurisdiction to deliver this verdict and for that the Government have decided to challenge the HC decision at the Appellate Division of Supreme Court. As the object of Judicial Review is to ensure that the authority does not abuse its powers and being the guardian of the Constitution of the land, it is now up to the Appellate Division to decide this case and declare its final judgement which will bound to be followed in all the spheres of administration. The Marbury Vs. Madison, 5 U.S. 137 (1803) case was a landmark decision in the implementation of Judicial Review which laid the foundation of this concept in the United States. It dates back to November 1800 when Thomas Jefferson was voted as the 3rd president of USA. But he would not assume office until March, 1801. This enabled president Adams to appoint new govt. officials before the new president take office. Jefferson was a Democrat-Republican but Adams was a Federalist. So the ‘Lame Duck’ congress took the opportunity to pass the Judiciary Act of 1801. These ensured additional federalists would be in powerful positions in the new govt. According to the plan Adams appointed 16 Federalist Circuit Judges & 42 Federalist Judges who were all called as ‘Midnight Judges’ (i.e., the last minute appointment). One of them was Willium Marbury who was named as Justice of Peace for the district of Columbia. When Thomas Jefferson started office, his Secretary of State, James Madison, did not deliver the official paper works to the ‘Midnight Judges’. Thus, they, including Marbury, were denied their new jobs. As a result, Marbury petitioned for a writ of mandamus to force Madison to deliver the commission. Meanwhile, Chief Justice, John Marshall, denied the petition and refused to issue the writ of mandamus, even though section 13 of the Judiciary Act of 1789 gave the Supreme Court authority for such writs to be issued, as the Article 3 of the USA Constitution does not recognize the power to force actions of the govt. officials. Therefore, the following questions arose. (1) whether or not the petitioner has a right to the commission he demands, (2) if he has a right, which is violated, do the laws of the country afford him a remedy and (3) whether or not Section 13 of the Judiciary Act was in violation of the Constitution. The Chief Justice found that the petitioners were entitled to their commissions but the Constitution did not give power to the Supreme Court to issue writs of mandamus even though section 13 did. Thus, it was inconsistent with the Constitution, therefore invalid. As the Constitution is superior to any ordinary Act of the legislature, a Court may declare an Act of Congress void if it is inconsistent with it. The Constitution placed the entire confidence upon the supreme executive regarding delivering and withholding a commission as a political act for any misconduct, respecting which, the injured individual (Marbury) has no remedy. The decision increased the Court’s power by encouraging the judicial department to say what the law actually is. So from this, a court may now declare an Act of the Congress/Parliament void if it found prove that the Act was inconsistent with the Constitution. Bangladesh has also obtained this view and, as stated before, the articles 7(2), 26, 44(1) & 102 of the Bangladesh Constitution indirectly support it. Article 7(2) established supremacy of the Constitution by saying if any other law is inconsistent with this Constitution that law shall, to the extent of the inconsistency, be void. Article 26 and 44 denotes that laws inconsistent with fundamental rights will be void. However, this does not apply to any amendment of the Constitution made under article 142. While judicial review power is vested in the High Court Division under article 102(1) which is one of the basic structures of the constitution and it cannot be taken away. Whereas judicial review power under article 102(2) is not fundamental or guaranteed, it is only available if no other equally efficacious remedy is available. Again, there exists article 47 according to which no law shall be deemed to be void on the ground of inconsistency with the Constitution if Parliament expressly declares that such provisions have been made to give effect to any of the fundamental principles of state policy. This article is a clear contradiction to the above articles. Hence, this is a hindrance to the Judicial Review system of Bangladesh as many inconsistent and harmful Acts can be passed through it. The present legal system is very rigid and complicated. There remains the hunger of gaining more and more powers which will surely disrupt the structure of the Government if left untreated and unchecked. 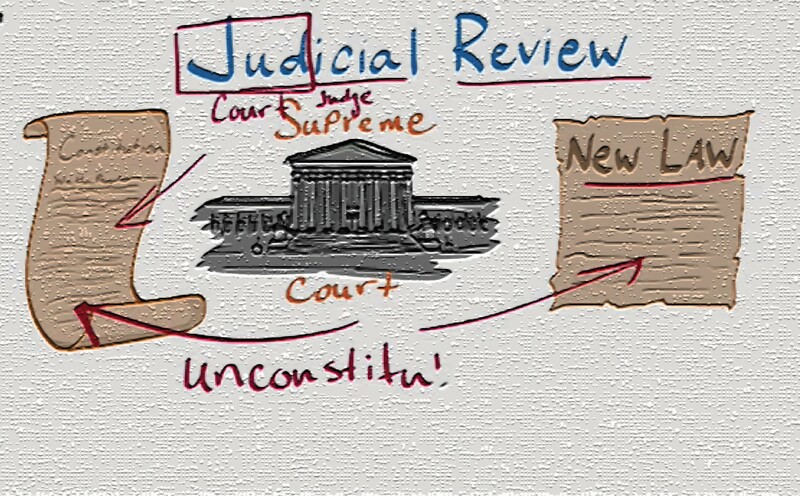 Judicial Review system tries to maintain and develop the structure by implementing some checks and balances which can surely protect a nation from imminent disruption. Asef Rafid is a 3rd year Law student of University of Rajshahi and is a former student of Dinajpur Zilla School. Rafid like to writes poem as a hobby. He is a proud member of RUMCS and has been involved with UNYSAB Rajshahi Wing. He can be reached at asefrafid@gmail.com.